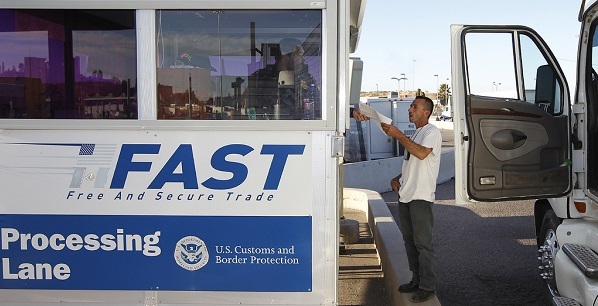 The FAST program allows expedited customs clearance for commercial truck drivers who have completed security and background checks. Step 1: Pay our service fee for checking and submitting your application to CBP for review by clicking on the Pay Now button. After we establish your GOES profile, we will give you a link to pay the $50 government fee for background and security checks. Step 2: Download the relevant application form. Fill out one application per applicant. In order to get a FAST card with us you will have to pay a $99.95 service fee plus $50 government fee. The service fee is payable through Pay Now to Passport and Visa Service. The government fee is payable with you credit card after your profile has been established in the government system. Once we match your application to your payment, we will pass it to one of our agents. 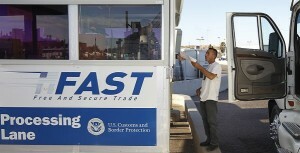 They will check your application for mistakes, omissions and for consistence with CBP requirements. They will create a profile for you in the government system and enter your data. Once this task is complete, we will email you with an ID and password so you can access your profile and finalize your application by paying the government fee with your credit card. You will be able to schedule your FAST interview as soon as you receive a conditional approval notification, in 4-8 weeks. Important: we cannot guarantee your FAST program approval. You may be denied in case you have a criminal record, an immigration violation or you provided false information on your application form. You can apply directly with CBP here: cbp.gov.